The Gocycle GS has a lot of the same sophisticated features as the top of the line G3 but at a more economical price of $2,799. The biggest difference between the flagship G3 and the new GS is the absence of the front daytime running light and the predictive, electronic shifting. Other minor differences include a fixed height front handlebar stem on the GS versus the adjustable stem on the G3 and slightly less ergonomic handlebar grips on the GS. The GS does benefit from two-tone color options but the G3 certainly wins my vote for elegance with fully internal cable routing vs the partially external routing on the GS. All Gocycles are made from injection molded magnesium, a process that is much more environmentally friendly than using carbon fiber. 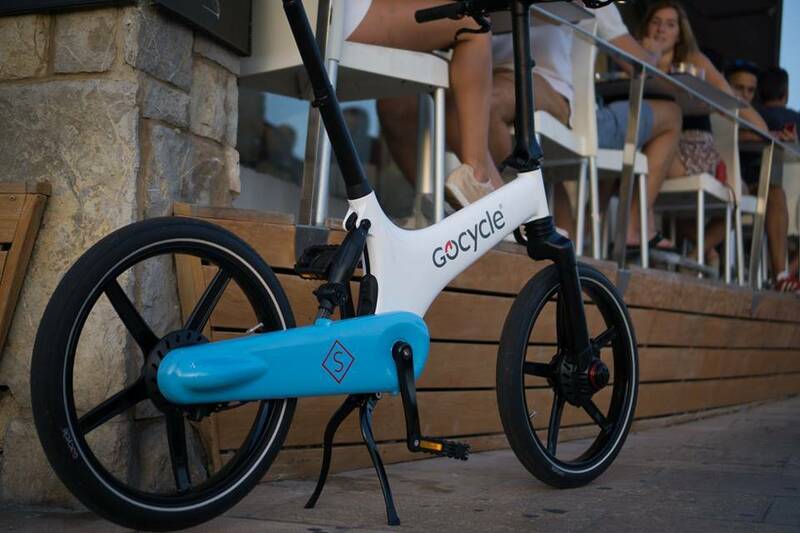 According to Richard Thorpe, founder of GoCycle, “Gocycle uses an environmentally-friendly process called Thixomolding® to create its high-tech, durable, ultra-lightweight magnesium frame and wheels. The Thixomolding® process does not produce any ozone depleting SF6 emissions, but will still give the rider the similar weight and structural benfits as carbon fibre. Frame: Gocycle injection moulded magnesium monocoque with rear suspension (1″ travel ). Fork: Gocycle proprietary, single-sided, 6061 T6, Uni-form 3D Forged. Motor: 500 watt Gocycle proprietary front hub geared motor. Battery: 22V 13.5ah (297 watt hour) lithium battery enclosed in the main frame. 7 hour charge time. 3.5 hours with optional fast charger. Assist Options: Torque sensing pedal assist and/or throttle. Display: GocycleConnect wireless smartphone app (iOS or Android) provides these modes: City, Eco, On Demand (throttle), and Custom modes that you can set. The custom settings can only be applied with the smartphone app. Drivetrain: Fully enclosed chain drive (Cleandrive®) with Shimano Nexus 3 speed internally geared rear hub with Microshift grip shifter. Brakeset: Hydraulic disc brakes front and rear. Wheels: Gocycle Pitstopwheels® injection moulded magnesium with side mounted quick release system. Tires: Gocycle Performance Tyre (20 x 1.75 in). Sizes: 1 size that fits riders from 5′ to 6’5” and you can order a compact seat post that will fit riders down to 4’6”. Price: $2,799 base price which includes the accessories of smartphone holder, kickstand, fold leg, anti-theft wheel bolts.